Who loves Halloween? But of course you do! What other occasion offers you the chance to eat sweets til you're sick, drink alcohol, dress up like a prat, demand sweets from strangers, play practical jokes on unsuspecting members of the public and make a godawful mess carving pumpkins? Sadly, I'm too old to dress up and demand sweets from strangers without them calling the police, so I did not go trick and treating. But you're never too old for gingerbread men, so I decided to make these delicious biscuits with a bit of a twist. 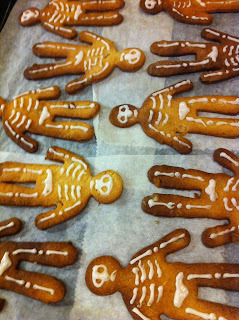 After all, why go out and bully your neighbours for sweets when you could have endless fun making and icing 40 gingerbread men? And believe me, it feels endless after the first couple of hours. 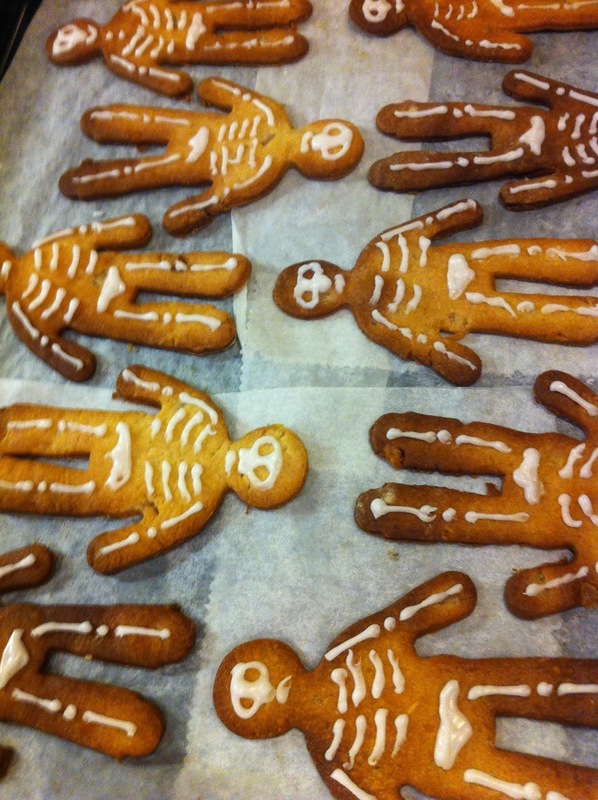 The recipe I based mine on was supposed to make 20, but it made 40, because I like my gingerbread men thin and crisp. So if you're going to roll your dough thin as well, then use half quantities for 20 biscuits. 1. Mix the flour and ginger together in a large bowl. 2. Add the butter in cubes and rub in with your fingertips to make crumbs. 3. Add the egg, syrup, sugar and chopped stem ginger and stir with a wooden spoon until it comes together into a dough. 4. With floured hands and on a floured work surface, roll out the dough (with a floured rolling pin) to desired thickness (I think this is a matter of personal preference). 5. Cut out the gingerbread men, kneading any offcuts back together and rolling out again. Bake on a lined baking sheet for 7.5-15 minutes at 180C, depending on thickness until an even brown colour. 6. While the biscuits cool, beat together the icing sugar and lemon into a smooth consistency. Spoon into a piping bag and cut a tiny bit off the end - enough so the icing comes out smoothly but you can still do some pretty delicate piping. 8. 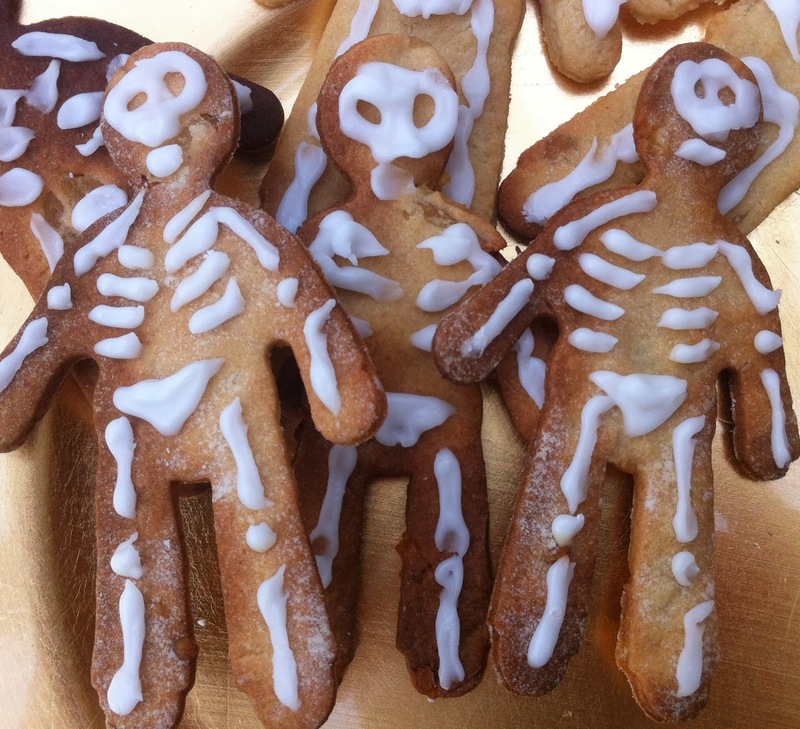 Voila, spooky skeleton gingerbread men! The great thing about these is that even if Halloween is too spooky for you, you'll love these, because being able to bite off their heads and eat them really takes the fear out of ghouls and ghosties. And they do taste pretty amazing. I would like to pretend that all the biscuits were as beautifully iced as those above, but after the first 20 I got bored, so by the last 5 or so they were just series of blobs. Enjoy, my little creatures of the night.